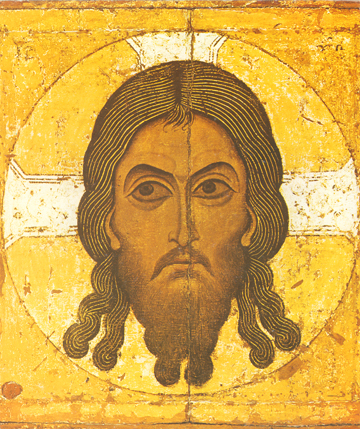 This icon is one side of a two-sided icon originally from the Dormition Cathedral in the Moscow Kremlin and is very striking in appearance with Christ’s face boldly standing out against the large cruciform nimbus or halo in the background. His hair extends outward in four locks, with His beard in two locks, and His eyes fix on us powerfully to mystically respond by entering a deeper relationship with Him. He is most truly majestic and radiant.